Chelated micronutrients are widely used in agriculture and are strongly promoted by the hydroponics industry. But exactly what are they and why should they be used? The word chelate is derived from the Greek word for “claw”. The term makes for an appropriate association because chelation is a process similar to grasping and holding an object with a claw, but in the case of plant nutrients this takes place with minerals on a molecular level. Chelation occurs when large organic or synthetic carbon molecules form multiple encapsulating bonds with a micronutrient, protecting it from reacting with other elements in the nutrient solution and thus increasing its availability to the plant by facilitating its absorption. In fertilizer technology, chelation refers to trace elements/minerals which are encapsulated by an electronically neutral (non-ionic) organic or synthetic molecule. The example below shows how a positively charged (cationic) nutrient such as iron combines with the chemical EDTA to form a chelate. In plain terminology, the EDTA complex surrounds the cationic metal molecule and forms weak bonds with it, effectively giving the nutrient a neutral synthetic coating. Chelates are especially effective for use with micronutrients being applied to alkaline soils. This is because iron, manganese, zinc and copper react with the ions found at high pH levels to form insoluble substances. As a result, the nutrients are made unavailable to plants. However, the chelate’s non-ionic coating prevents these reactions from occurring in the soil or other growth media. Plant roots are then able to absorb and take up the chelated nutrient allowing the chelate to release the nutrient within the plant. The more bonds that form between the ion and the carbon atoms – either synthetic or organic forms of carbon – the stronger the ion is held within the chelate. 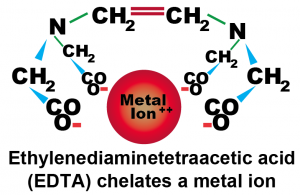 The strength of the chelate’s hold on the ion determines, as pH increases, how long the element will continue to be available to a given plant. The value of chelation becomes clear when one realizes that many micronutrients are unavailable to plants in their basic forms. This is almost always due to the fact that these metals, such as iron, are positively charged, or cationc. Thus, a positively charged micronutrient will be rejected by the permeable outer root surface/membrane of a nutrient hungry plant which is negatively charged, or anionic. As a result, the element cannot enter the plant due to the difference in repelling electrical charges. However, when a chelate is added, it surrounds the metal/mineral ion and alters the charge into a neutral or slightly negative charge, allowing the element to easily pass through the semi-permeable root cell membrane and travel into the plant. There are several chelating agents that are commonly used in commercial fertilizers which are able to effectively neutralize the opposing electrical charges present between micronutrients and the root zone. The chelating agent is typically identified on the ingredient label next to the trace element/mineral it serves to chelate. If the label has EDTA written next to a trace element, the fertilizer contains ethylene-diamine-tetra-acetate, the most commonly used chelating agent. Higher quality grades of fertilizers may also contain DTPA (diethyle-netriamine-penta-acetate). EDDHA (ethylene-diamine-dihydroxy-phenylacetic-acid) represents the highest quality of synthetic chelating agents available and are the most effective across all growing environments. EDTA is the most widely used chelating agent and is effective for both soil and foliar applied nutrients; it has four molecular points of connection. Like other synthetic chelates, EDTA is recognized as a foreign compound by plants and is therefore absorbed by the plant but not metabolized. When the chelated element is required, the plant will remove the positively charged element – such as iron – from the chelate and absorb the element. However, since the chelating agent is foreign to the plant, it will reject the synthetic chelating agent back into the nutrient solution where it is once again free to chelate other elements. EDTA is better suited to slightly lower than neutral pH levels, as high pH conditions will cause it to prematurely release the element back into the nutrient solution instead of delivering it to its intended destination within the plant. DTPA is a chelating agent better suited for high pH conditions. It has five points of molecular connection to the element it chelates, allowing it to hold the element more tightly. DTPA is more costly than EDTA and is less soluble so it is found in smaller quantities than EDTA in most synthetic fertilizer formulations. The graph below shows the level of iron stability with different chelating agents at different pH levels. 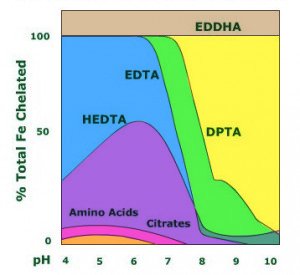 As clearly shown, EDDHA is the strongest chelate of any of the commonly used complexing materials and maintains iron availability to plants past pH 9.0. However, the other synthetic chelating agents are also highly effective as long as pH conditions are suitable. EDTA is better suited to slightly lower than a neutral pH level of 7. DTPA is most effective at slightly higher pH levels. Because it is the strongest and therefore most effective of the synthetic chelating agents, EDDHA is found only in select fertilizer formulations because of its relatively high cost. Along with organic enhancements, New Age Nutrient’s Maxx Micro base nutrient product uses EDDHA chelates to enable maximum absorption of micro nutrients, making their 3-part base nutrient system highly effective. Plants supplied with adequate levels of EDDHA are able to absorb more iron and zinc than plants supplied with EDTA, which is very important as zinc is often locked out in the later part of the flowering cycle due to excessive phosphorous levels. A zinc deficiency typically causes plant leaves to yellow. As seen in the list above, there are also a number of effective natural chelating agents; humic and fulvic acid being arguably the most effective and widely used. Humates, as they are generally referred to, are derived from decomposed organic matter which over time has been compacted into a form of sedimentary shale. Unlike synthetic complexes, humic and fulvic acids, as well as other organic chelators, can be utilized by plants for their nutrient content after passing through the root membrane, adding to the mobility of the nutrient elements within the plant itself. Humic/fulvic acids can be particularly effective when the growing environment in the rhizosphere is outside of optimal conditions. Even under adverse conditions, plants supplied with fulvic acid are greatly protected from stress and deficiency. In addition to humates, there are number of other natural substances used as chelating agents. Lignosulfonates, phenols and polyflavinoid chelates are produced using fermented by-products, mainly from the wood pulp industry. And while not providing the chelation strength of synthetics, lignosulfonate is nevertheless an effective chelator and also has surfactant/dispersant properties which make it an effective component of foliar sprays. In addition, ascorbic, boric, and citric acids are all organic acid compounds which provide a degree of mineral chelation by neutralizing positively charged mineral compounds. These organic carbon acids also play a useful role in vascular mineral transport. Enzymatically hydrolyzed protein is another organic nutrient additive with chelation properties. Plant proteins, or amino acids, naturally solubilize and translocate minerals for effective root uptake or leaf absorption. Ideally, in order to optimize growth in your garden, the use of several sources of chelation in the nutrient solution is recommended. This allows for more efficient nutrient absorption, transport, and other biochemical reactions. Therefore, to realize the best possible growth, fruiting and flowering results, administer nutrients to your garden that offer a range of chelating compounds, to ensure that nutrients will be available through a wide range of environmental conditions including those above or below optimal pH ranges. At a minimum, humates should be an integral part of any nutrient feeding program, because when employed in adequate amounts, a combination of several chelating agents will maximize nutrient uptake and increase photosynthetic response, and thus greatly increase plant performance and yields. Plants also benefit from the foliar application of chelated nutrients. However, plant leaves have a waxy coating that protects them from dehydration, and this surface wax also repels water and inorganic substances making it difficult for inorganic nutrients to penetrate into the leaf. On the other hand, organic molecules can effectively penetrate the protective wax barrier and also enter through leaf pores called stomata. Providing nourishment directly to the plant canopy in this way is an excellent method of stimulating rapid plant maturity.